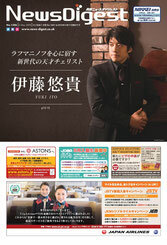 Yuki Ito, described as “world-class talent” by major international critiques, won 1st prize at both the International Brahms Competition in Austria in 2010 and the UK’s most prestigious Windsor Festival International String Competition in 2011. For his musical activities over 20 years, he was awarded the Hideo Saito Memorial Fund Award in 2018, the most honourable award for cellists in Japan given by Seiji Ozawa and Tsuyoshi Tsutsumi. He made his début with the Philharmonia Orchestra in 2011, and has since performed as soloist with many renowned orchestras and artists including Vladimir Ashkenazy, Seiji Ozawa, David Geringas and Julian Lloyd Webber. His recitals have taken place at such renowned venues as London’s Wigmore Hall, Royal Festival Hall, as well as a private recital personally invited by HRH The Prince Edward, Marigny Theatre in Paris, Marcello Theatre in Rome, Mirabell Palace in Salzburg, and Merkin Concert Hall in NYC. In 2016 he gave NHK Japan’s worldwide TV broadcast recital to commemorate the 120th birth of legendary author Kenji Miyazawa, whose centennial anniversary soloist was Yo-Yo Ma. 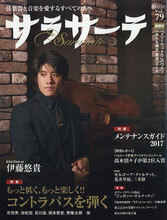 He is especially noted for his performance and interpretation of Rachmaninov's works, and introducing English Cello Music in Japan; he gave All-Rachmaninov-Recital at Wigmore Hall in 2018 as the first ever cellist in history. His début album “Rachmaninov Complete Cello Works” is receiving critical acclaim internationally, chosen as Recommended Disc by The Strad UKdescribing “Ito triumphs in Rachmaninov…Sensational recital”. His second album “The Romantic” for Sony Music label released in 2017 was chosen as Recommended Disc by Record Geijutsu Japan. He has been Artistic Director of Knightsbridge Philharmonic since 2013, and a radio presenter of his own show “Yuki Ito The Romantic” on every Sunday on Classical Music Internet Radio OTTAVA of Japan (available worldwide) since 2018. He studied with Alexander Boyarsky and David Geringas, and graduated from the Royal College of Music. He plays a Goffriller Cello made in 1734, kindly loaned to him by Nippon Violin.